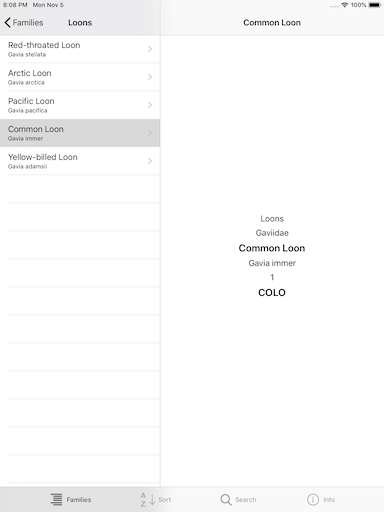 Learning Birds Check-list version 3.50 available in Apple App Store. 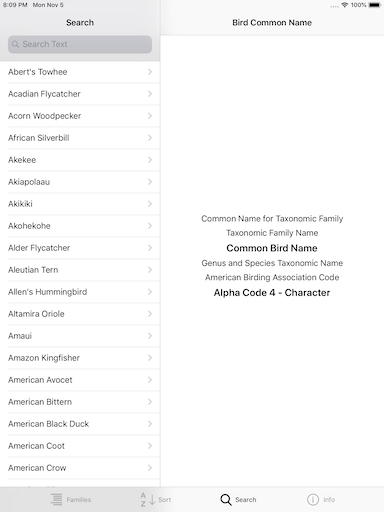 Check-list is an iOS app that provides information on each bird species in the ABA (American Birding Association) check-list version 8.0.3 August 2018 data. Information provided on each species consists of family or group name, family scientific name, common name, scientific name, ABA code and a four character alpha code. The data from the ABA is based on the 59th supplement fo the AOS (American Ornithological Society) formely, AOU (American Ornithologists Union) checklist of North and Middle America birds. 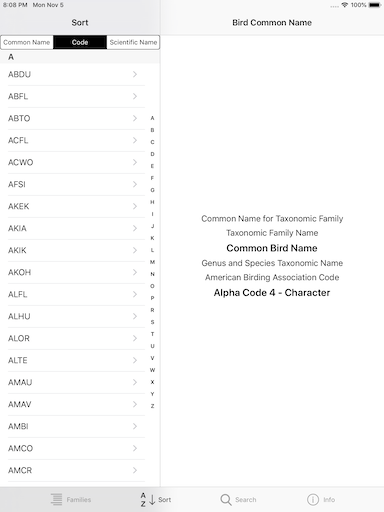 The four character alpha code is based on The Institute for Bird Populations naming conventions not the USGS (United States Geological Survey) bird banding codes. There are a total of 1112 birds listed with their family or group name, common name, common names genus and species taxonomic name, ABA code and four character alpha code. The application provides different means to find information on each bird species. The user can browse in taxonomy order of bird species. 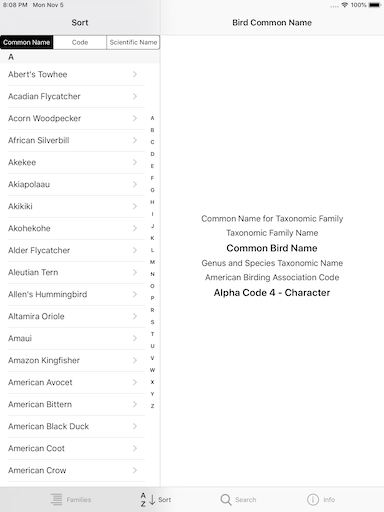 Sort bird species by common name, alpha code or scientific name. 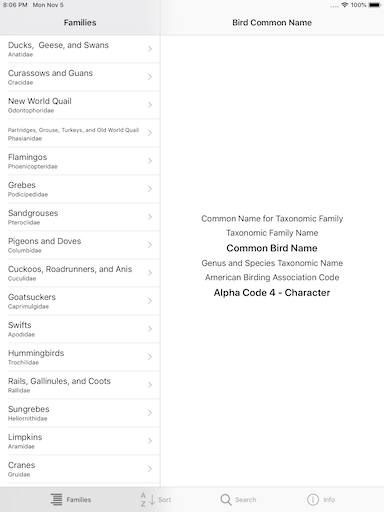 Search bird species by common name, alpha code or scientific name. 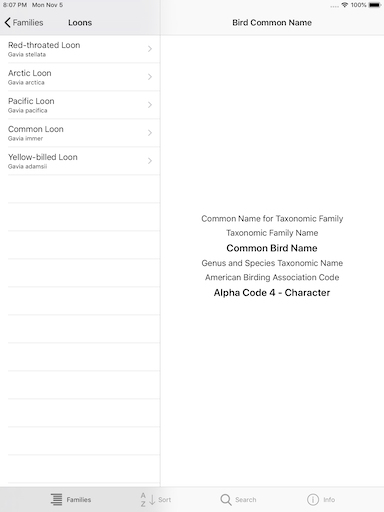 This is the initial screen for the application showing the bird families in taxonomy order in the left pane. In the right pane a description of the detail information that is displayed once a bird species is selected. This screen shows the results once the user has selected the Loon family. The bird species of the Loon families are displayed in the left pane. This screen the user has selected the Common Loon from the Loon family. The detailed information for a Common Loon are displayed in the right pane. This screen the user has selected the sort tab and the list is sorted by common name. This screen the user has selected sort option code and the list is sorted by alpha code. This screen the user has selected the search tab. The default for this screen is a list of birds sorted by common name. This screen the user has typed common l and selected Common Loon. 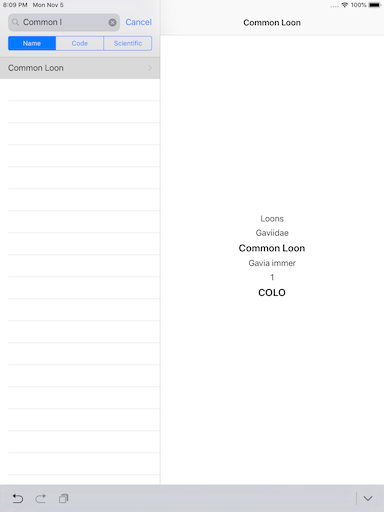 The detailed information for Common Loon is displayed in the detail pane.